Soul 547888842613 awakens to find himself in a holding cell of hell. After being released by his supposed tour guide and soul collector, Arma, he discovers an emptiness within himself that he can’t quite shake. 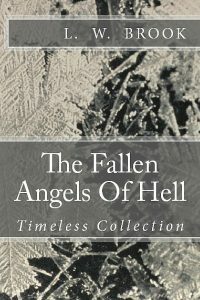 With the center of hell a freezing pit of fire, an intruder in the midst, and a soulmate MIA, the fallen angels of hell scurry to restore the balance. My novella, The Fallen Angels Of Hell, was inspired in part by what it is I already know about Lucifer/angels/demons and so forth. The story exists almost entirely in “hell” or at least what I believe hell to be like. Instead of an eternal punishment, I made the place home for the odd balls because, really, that sounds much more charming to me than a fiery dungeon. My main character is actually the soul of another character I’ve previously written (not that anyone would notice right away). The stories I write connect in strange little ways, and in this case, the characters are what tie this novel to the others.